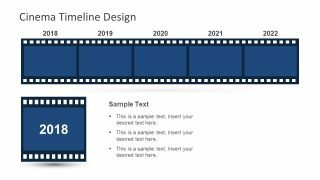 The Cinema Timeline Template for PowerPoint is a horizontal movie presentation of film reel graphics. 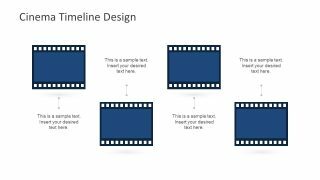 This is an outstanding template to illustrate the cinematographic concepts and relevant topics. 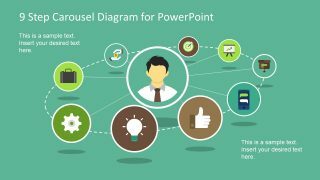 This PowerPoint is ideal to display movie schedules, upcoming films, casts and trailers etc. More importantly, present the history of cinema and the evolution of advance technology. 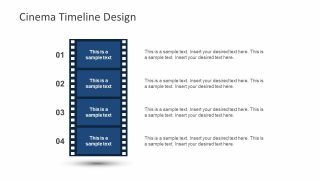 For instance, the first slide has horizontal reel as timeline and planning template of 4 segments. 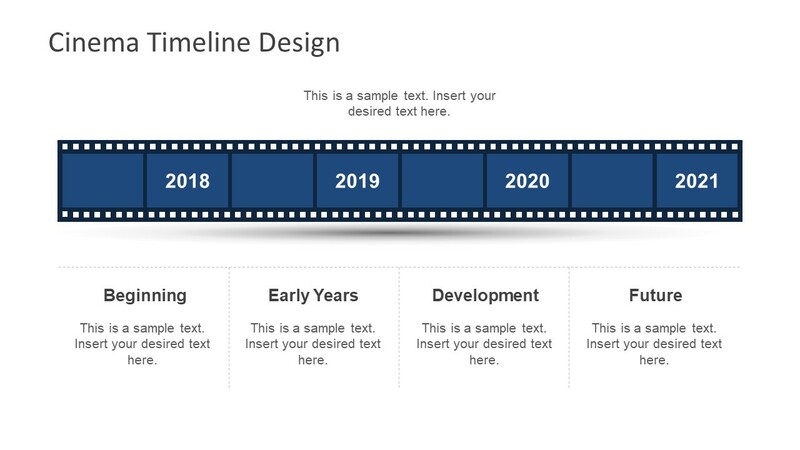 The 4 years represent these four segments which and an editable text boxes. This slide demonstrates the history, new development and the future of film industry. The users can add relevant content to the text placeholders available for notes. 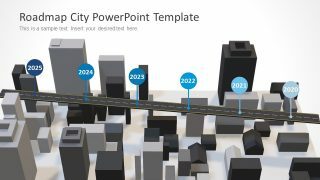 Moreover, the film reel and text are fully customizable elements of PowerPoint. Therefore, changing the colors, fonts and sizes is achievable in few clicks. 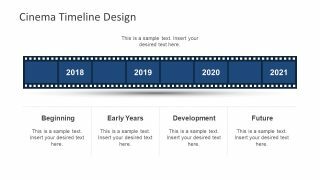 The 9-slide amazing Cinema Timeline Template for PowerPoint has different horizontal and vertical timeline formats. 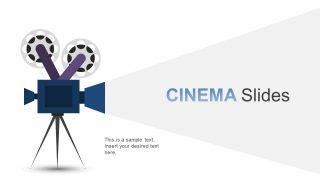 Moreover, the PowerPoint contain vintage movie camera graphics and 4 step zigzag diagram of film-reel segments. 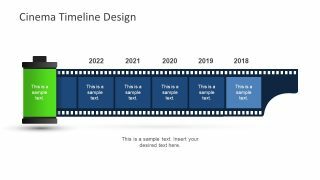 The PowerPoint of cinema timeline template is resourceful for academic professionals in film schools. The graphic content can enhance the engagement of audience while discussing the topics from basics of cinematography to the acting. 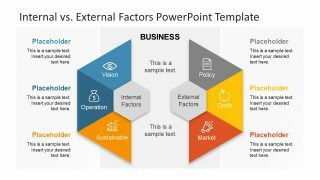 The PowerPoint also has an incredible slide of more than 40 infographic icons. 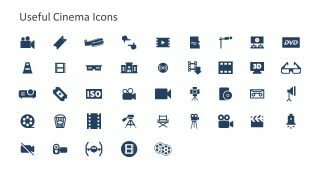 This slide contains creative and useful infographic of cinema and film industry to reuse in number of presentations. Further, the infographics are flat design vector objects. 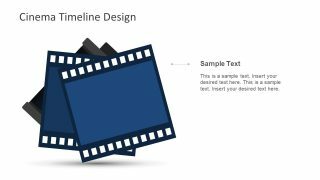 Therefore, the users can resize them to any number and use as silhouette images as well. 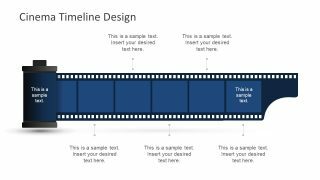 The PowerPoint of cinema timeline design is a motion pictures template with a generic touch of films. The template can assist in displaying movie reviews, critics and upcoming film release. 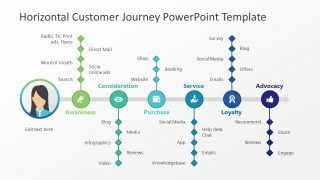 Similarly, it is helpful in presenting editing and film making techniques like software tools and camera specifications etc.